The concept of policy is the American political imagination’s self-circumscribed border. You can do what you like with policies–build, mold, destroy, rearrange–but the context in which policies appear is static, unchanging. Policies can reflect different governing philosophies, but only those philosophies which endorse governing through policy. Policy can shape philosophy as much as philosophy shapes policy. Policies deal with the tactile and the quantifiable. If it’s not measurable, it’s not truly thinkable. Policy is hostile to virtue ethics or theology, but it loves utilitarianism. To the extent that policy addresses psychology, it turns us all into behaviorists. Behavioral economics has made policy more sophisticated, but it has also made its outer limits more sharply visible. The ultimate end of modern politics is to exert as much influence as possible over policy making. You can do that either by electing your own policy makers or by influencing the ones already in office. Elected officials, public institutions and interest groups form alliances and compete among one another to most effectively dominate the policy-making process. Within those categories, political actors are distinguishable only by their stated policy preferences, the amount of power they wield, and how they use that power. So, for example, all interest groups are identical insofar as they all do more or less the same thing in the same way. A labor union is indistinguishable from a pro-life activist group is indistinguishable from the Chamber of Commerce until you examine their stated policy preferences and the strategies they use to achieve them. This is essentially why Occupy Wall Street was so baffling: it refused to behave like an interest group. When members of the press urged Occupy to release its demands, they were really asking for a menu of policy preferences. Occupy Wall Street’s idea of a politics beyond policy seemed as intelligible as a language spoken without words. But that idea’s moment has passed, at least for now, along with its frightening ambiguities. Policy has resumed its central, uncontested place in political discourse. Occupy–cloudy, confusing and inchoate–has ceded to the simple, comforting, and diamond-hard. Even more comforting: Paul Ryan’s appearance on the Republican presidential ticket this election cycle. Conventional wisdom has it that his presence will make the election especially policy-heavy. Here’s hoping! Social scientists have more precisely tracked Americans’ isolation and reports of loneliness over the last several decades. The real news, they have discovered, is that there is no such epidemic; there isn’t even a meaningful trend. If we turned to historians to measure Americans’ degree of isolation over the centuries, they would probably find periods of growing and lessening social connection. The rough evidence indicates a general decline in isolation. The point is, some of our brightest social theorists seem to over-ready to identify troubling trends or newly urgent problems when there is actually very little evidence of any trend, or that this or that problem has actually deepened. A simple explanation of this sort of error is that we intuitively take our own increasing awareness of a problem as evidence that the problem has become objectively more salient. We should watch out for this. “Increasing awareness of a problem” is one way of looking at it. A related (and not entirely mutually exclusive) possibility is that we’re seeing something that’s always been true, and, for the first time, turning it into a problem to be solved. Facebook may not make us lonelier, but it certainly promises to salve the loneliness we already carry around with us. Same with other social networking platforms. If we have the theoretical ability to remain in perpetual play and discourse with our friends and loved ones, then what right do we have to be lonely? Maybe we’re looking at the whole problem backwards. Maybe loneliness isn’t inherently a defect to be fixed by more social interaction. In fact, social interaction can sometimes exacerbate it — even face-to-face meatspace social interaction. In those cases, introspection and solitude can be a balm. A controlled exploration of loneliness may be more healthy, long-term, than resorting to social distraction. You might not be able to construct a permanent bulwark against loneliness, but when it rushes past your defenses you can at least acknowledge it as an old and familiar acquaintance. This doesn’t sound crazy or counter-intuitive to me. In fact, it sounds pretty obvious. But this whole discussion seems to be predicated on the popular assumption that loneliness is always an enemy from whom you should flee. That assumption, I would argue, is the true epidemic. *My words, not his. But as far as I can tell, poking and Farmville are both over now. As a boy, I lived for some time in the country and I clearly remember an experience from those days: I used to walk to school in a nearby village along a cart track through the fields and, on the way, see on the horizon a huge smokestack of some hurriedly built factory, in all likelihood in the service of war. It spewed dense brown smoke and scattered it across the sky. Each time I saw it, I had an intense sense of something profoundly wrong, of humans soiling the heavens. I have no idea whether there was something like a science of ecology in those days; if there was, I certainly knew nothing of it. Still that “soiling of the heavens” offended me spontaneously. It seemed to me that, in it, humans are guilty of something, that they destroy something important, arbitrarily disrupting the natural order of things, and that such things cannot go unpunished. To be sure, my revulsion was largely aesthetic; I knew nothing then of the noxious emissions which would one day devastate our forests, exterminate game, and endanger the health of people. To me, personally, the smokestack soiling the heavens is not just a regrettable lapse of a technology that failed to include “the ecological factor” in its calculation, one which can be easily corrected with the appropriate filter. To me it is more, the symbol of an age which seeks to transcend the boundaries of the natural world and its norms and to make it into a merely private concern, a matter of subjective preference and private feeling, of the illusions, prejudices, and whims of a “mere” individual. It is a symbol of an epoch which denies the binding importance of personal experienceincluding the experience of mystery and of the absoluteand displaces the personally experienced absolute as the measure of the world with a new, man-made absolute, devoid of mystery, free of the “whims” of subjectivity and, as such, impersonal and inhuman. It is the absolute of so-called objectivity: the objective, rational cognition of the scientific model of the world. I favor “antipolitical politics,” that is, politics not as the technology of power and manipulation, of cybernetic rule over humans or as the art of the utilitarian, but politics as one of the ways of seeking and achieving meaningful lives, of protecting them and setving them. I favor politics as practical morality, as service to the truth, as essentially human and humanly measured care for our fellow humans. It is, I presume, an approach which, in this world, is extremely impractical and difficult to apply in dailv life. Still, I know no better alternative. I’m not a huge fan of the “anti-political” construction, which seems a little misleading. But this is surely on the right track, grounded as it is in a moral sense that we have allowed, sadly, to atrophy. Rob’s talking about the private sector here, but is there any better way to describe avid campaign trail watchers than, “at once too savvy and not savvy enough?” It’s amazing, for example, just how closely Rob’s account of the life of a hyped product maps onto the arc of the “Obama ate a dog” meme. That meme doubtless enjoyed such a long time in the sun because the people who first hyped it wanted everyone else to buy it — but the savvy onlookers who mocked its insignificance and wove increasingly elaborate dog-eating puns surely extended the meme’s lifespan. In their hurry to show how smart they were for not falling for such a dumb story, they hyped it up some more. But in that case, what’s actually being hyped? I would argue that what’s actually being sold — unbeknownst to the people doing most of the selling — is not one particular campaign meme, but a general assertion about the value of that genus of campaign memes. When Democratic pundit X tweets, “This Obama eats a dog story is really stupid and trivial” as if that’s news, they’re reinforcing the implicit assumption that it could have ever been anything but stupid and trivial. The dog-eating story is trivial, but Romney putting the dog kennel on top of the car is significant. George W. Bush clearing brush is trivial, but Hillary Clinton in sunglasses is an important reminder of how cool she is. And so it goes. When you hype a particular team, you’re also hyping the whole sport. The above clip comes from Adam Curtis’ four-part BBC documentary series, The Century of the Self, in which he tries to show how the modern West came to be ruled by (in his eyes) an ideology of radical individualism. Politics, he argues, is no longer about communal interests or the promise of a different world; it is instead about administering to the present state of affairs, and satisfying the individual’s self-interested needs and desires. Curtis returned to that theme, one of his favorites, in a talk he delivered last weekend in New York City’s e-flux gallery. There, he expressed frustration with Occupy Wall Street and the left in general, saying that both had failed to come up with a workable alternative to the cult of the individual. Horizontalism, in Curtis’ dim view, is little more than an anarchified twist on the old fallacy of the market’s invisible hand: both posit that a mass of people all expressing their own individual preferences can somehow yield a coherent, dynamic, and mutually beneficial ecosystem. Granted, much of the movie tends toward the breathlessly hyperbolic, and its mission is more polemical than analytical. But ever since I first saw it in high school, I’ve been fascinated by one of its key premises (one only hinted at by the Noam Chomsky line in the trailer): that if were to treat corporations as persons in more than just a legal sense, we’d have to regard them as dangerous sociopaths. Now, few people (except maybe Eric Schwitzgebel) would argue that corporations actually are people in any meaningful, extra-legal sense. But we can easily imagine what a person would look like if he possessed some of the traits of a corporation. The primary responsibility, perhaps the sole responsibility, of a corporation is to accrue profit for its shareholders. Seeing like a corporation, everything else — ever single object, person, physical space, and idea — assumes an instrumental value relative to its ability to help the corporation achieve that end. The notion of a “good corporate citizen” is pretty much a myth, except insofar as presenting a public image of good citizenship will help make the corporation more profitable. This all strikes me as relatively uncontroversial, even banal. The crucial debate is not over the characteristics of a corporation, but over whether those characteristics are being harnessed to good ends. That is to say: Is corporate enlightened self-interest fueling economic growth, raising the overall standard of living, and contributing to human flourishing? Or not? Let’s bracket that question, for the purposes of that blog post. Instead, I’d like us to consider what happens when we graft the basic elements of corporate self-interest onto a human person. Unless you’re an orthodox Randian, we should be able to agree that someone who lives his entire life on the basis rapacious self-interest and instrumentalism is probably pretty horrible. If not a textbook sociopath (I’ll leave that up to the professional psychologists), he’d at least fit the term as it’s used idiomatically. He’d also be what we commonly understand as a narcissist. That could give us a pretty decent frame for understanding the phenomenon I tried to pin down in my last post, regarding what’s now being commonly (and rather obnoxiously) referred to as “Generation Me.” If 20-30 year olds are more brutishly self-interested than their parents, and if, as I argue, this is a byproduct of growing up under neoliberalism and into an age of scarcity, then we might understand what’s happening to young people as a sort of process of reverse corporate personhood. That is to say: in an increasingly competitive market defined by the ethics and conventions of the corporate world, young people rightly intuit that the most successful actors will be those who behave most like one-person corporate entities. I’m not a sociologist, so I don’t quite have the empirical grounding to back that analysis up. But I do have some formal background in philosophy, which might be able to provide some insight from a different angle. When I write about this next, I’ll probably try and dive into the phenomenology of corporate personhood. Two intellectual trends dominate the burgeoning, nonexistent field of Millennials Studies: one is a few years old, but the other one seems to just be catching on. 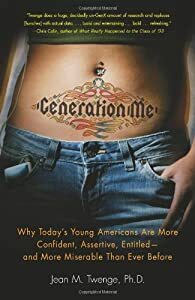 The older trend is, of course, the growing body of work in social psychology purporting to demonstrate that kids these days are more narcissistic than their parents or grandparents. The younger trend is the growing body of work purporting to demonstrate that kids these days will spend the rest of their lives being fucked sideways by the unsustainable economic consumption and political myopia of the Boomer generation. There are reasonable critiques you can make of either of these theories, but I find them both provisionally persuasive — that is, enough to at least entertain the possibility that my age bracket is, statistically speaking, both uniquely solipsistic and uniquely screwed. Which is enough to make a body wonder if there’s any connection between the two phenomena. So what follows is a blog-sized sketch of how one might go about marrying the two theories. It’s crude, but I think it carries some conceptual force.